When I was a boy I was afraid to bicycle past a Doberman pinscher who was, according to the kid who owned him, so fierce that it often chewed through its chain and went on bloodthirsty rampages. I was afraid of the night terrors that tore me from sleep and sent me screaming through the house. I was afraid of ending up in a situation where I would be forced to eat fruit. I was afraid of death. I was afraid of bullies. I was afraid of girls. I was afraid of our basement. After I saw The Shining I was afraid of our bathtub. I was afraid of the three-note Duracell ditty that ended with the sectioned battery slamming together. I was afraid of nuclear bombs. You could be sitting there on the floor of your room, sorting your newest baseball cards into their respective teams, and it could all vanish in one bright flash. I was afraid of everything ending. In light of all those fears, I can’t really say that I was afraid of Ron Guidry. I mean, I wasn’t afraid Ron Guidry was going to leap out from behind a snowbank and bash me with a rock. I wasn’t afraid Ron Guidry was going to force me to touch my tongue to a frozen metal pole. I wasn’t afraid Ron Guidry was going to burn our house down. 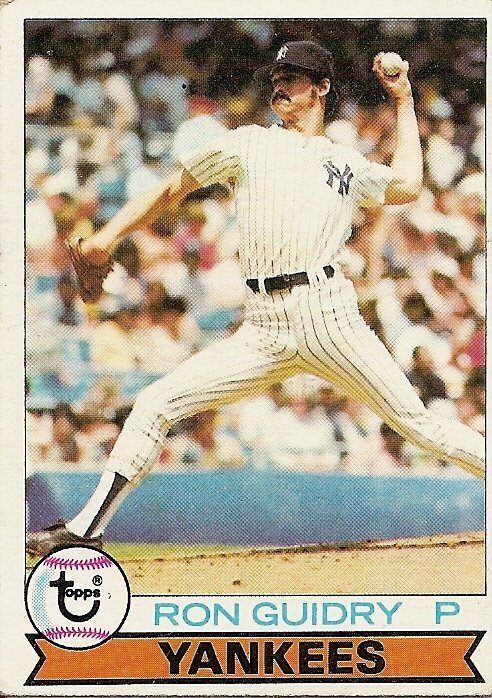 And yet, when I hold this 1979 Ron Guidry card in my hand, even thirty years after he went 25-3 with a 1.74 ERA—numbers so astounding they seem inhuman, merciless, obsidian, obscene—to lead the 100-win Yankees past my team, the 99-win Red Sox, it’s as if I’m holding a small box made of thin, fragile glass, a scorpion inside. You are currently browsing the archives for the Ron Guidry category.